Root Canal – What Is It? A root canal is a procedure to remove the nerve or pulp of a badly decayed or infected tooth to treat an abscess, toothache or dental infection. Root canal therapy is a remarkable treatment with a very high rate of success. It involves removing the diseased tissue, halting the spread of infection, and restoring the healthy portion of the tooth. 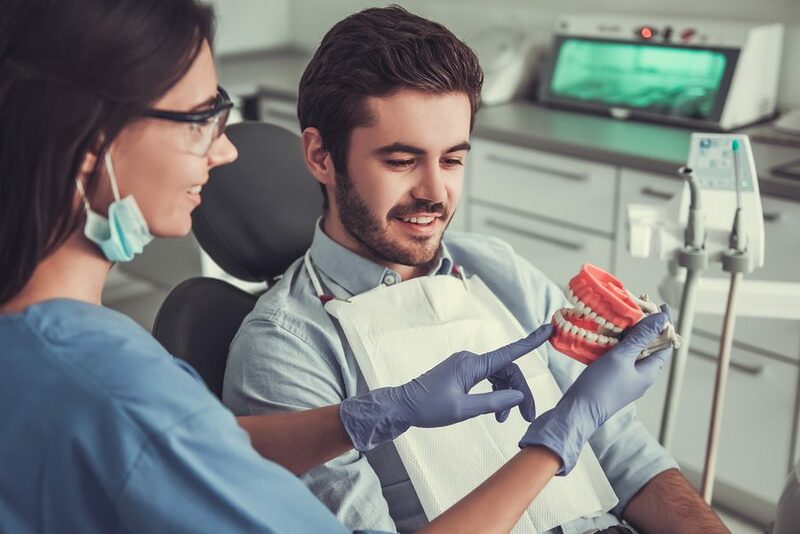 In fact, root canal therapy is designed to save a problem tooth; before the procedure was developed and gained acceptance, the only alternative for treating a diseased tooth was extraction. The term root canal refers to the tiny passageways that branch off under the top of the tooth, coursing their way down until they reach the tip of the root. All teeth have between one and four root canals. Many tooth problems involve infections that spread to the pulp, which is the inner chamber of the tooth containing blood vessels, nerves and other tissues. The function of the nerve is to help in the formation and development of the tooth. After a tooth has erupted or appears in the mouth, its nerve is not crucial to the function of the tooth. Once the tooth is fully developed it is nourished by the surrounding tissues. If the nerve becomes infected and is removed as part of a root canal procedure, the daily function of the tooth should be unchanged. The pulp can be injured, damaged or infected from a cracked tooth, broken tooth, large fillings, deep decay or cavity, multiple dental procedures on a tooth or trauma. Once the nerve tissue or pulp is injured, it starts to break down and bacteria can grow in the pulp chamber. As the bacteria multiply they cause an infection in the tooth that spreads to the end of the tooth’s roots. This is called an abscess. An abscess can spread beyond the roots of the tooth, causing bone loss or swelling. Swelling and infections caused by an abscess can spread to the head or neck and can be very dangerous. The signs and symptoms that a root canal is necessary may include a painful toothache that wakes you up at night or keeps you up, a pain in your tooth when you bite or chew, swelling of your gums and/or face, blisters on your gums, or increased and lingering sensitivity to hot and cold temperatures. Sometimes there are no symptoms at all. An abscess will not go away on its own. It will continue to grow and potentially threaten your health. If the abscess bursts you will have a foul smelling and tasting liquid in your mouth. Treatment for a dental abscess is usually root canal therapy. Sometimes, if the abscess is severe, the tooth may need to be extracted. To diagnosis the need for a root canal, Dr. Shamblott talks to his patients to find out what signs and symptoms they have been experiencing. He may perform tests on those teeth, including tapping on the teeth or placing a cold cotton pellet on the tooth. The next step is to take x-rays tooth to assess the extent of the infection in the tooth and bone. If your tooth needs a root canal, Novocaine or local anesthesia will be used to numb your tooth for the root canal procedure. All of the decay will be removed from the tooth and a small hole made into the pulp chamber. A rubber dam (a sheet of rubber with holes in it for your teeth) is placed over your tooth to keep the area dry and make the procedure go faster. 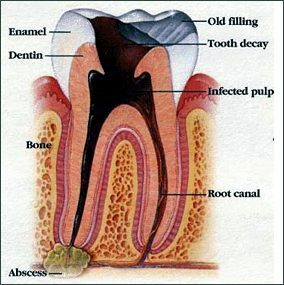 The damaged pulp and bacteria are removed from the tooth using a series of small files. The files are used in order of increasing diameter to clean and shape the canals of the tooth down to the tip of the root. Various solutions are used to clean and sterilize the canals. After the canals have been sterilized, root canal filling material called gutta percha and special cement are placed in the canals. The position of the gutta percha is verified with more x-rays. The access hole of the tooth is filled with tooth-colored build-up material. Most teeth that receive root canals need a crown to protect the now brittle tooth and prevent it from fracturing and breaking. Root canal treatment has a bad reputation associated with severe pain. The root canal procedure is typically painless, with very little or no discomfort. Root canal therapy is successful more than 95% of the time. Instead of having root canal therapy, one option may be to have your tooth removed or extracted and replaced with a bridge or implant. Saving your natural tooth is the best option to maintain your long-term chewing ability and appearance. Options to replace missing teeth are typically more expensive, time-consuming and often involve procedures on the adjacent teeth. Get out of pain today. Get rid of the dangerous dental infection. Call Shamblott Family Dentistry today at: 952-935-5599 for a free new patient exam and x-rays (panoramic and bitewing).